Gov. Rick Perry, a no-apologies conservative known for slashing government spending and opposing all tax increases, is about as Republican as you can get. Except when he wasn't. Gov. Rick Perry, a no-apologies conservative known for slashing government spending and opposing all tax increases, is about as Republican as you can get. Perry spent his first six years in politics as a Democrat, in a somewhat forgotten history that is sure to be revived and scrutinized by Republican opponents if he decides to run for president. A raging liberal he was not. Elected to represent a slice of rural West Texas in the state House of Representatives in 1984, Perry, a young rancher and cotton farmer, gained an early reputation as a fiscal conservative. He was one of a handful of freshman “pit bulls,” so named because they sat in the lower pit of the House Appropriations Committee, where they fought to keep spending low. But Perry cast some votes and took a few stands that seem to be at odds with the fiscal conservatism he champions today. The most vivid example is Perry’s support of the $5.7 billion tax hike in 1987, signed by Republican Gov. Bill Clements but opposed by most of the GOP members. The bill passed by a relatively close 78-70 in the Texas House. Even without adjusting for inflation, the legislation triggered the largest tax increase ever passed in modern Texas, according to Dale Craymer, president of the Texas Taxpayers and Research Association. Today, taking inflation into account, it would be worth more than $11 billion. Craymer said the new taxes were used to plug a massive budget shortfall, with the money representing about 20 percent of the general revenue raised during that two-year budget period. Almost a quarter century later, Perry, as governor, was faced with a similarly sized budget shortfall. But he took a markedly different tack in 2011: He opposed any new taxes, and signed a budget that made the first reduction in overall spending on public education since at least 1949. Perry spokesman Mark Miner said votes taken decades ago don’t undermine the governor’s overall record, which he said includes the largest property tax cut in state history, enacted in 2006. “You can pull votes from the 1980s, but the overall track record is one of fiscal responsibility and conservatism,” Miner said. As a House Democrat, Perry also co-authored legislation aimed at tripling the amount of money state legislators are paid, House records show. In a 1989 interview with the Abilene Reporter-News, Perry cited the financial hardships Texas legislators faced trying to make a living back home while making a yearly salary of only $7,200 as part-time lawmakers. Voters rejected the proposal in a statewide referendum. Perry said he could make ends meet only because his father tended to the farm while his wife worked as a nurse in Haskell, her hometown. Miner said Perry no longer favored giving legislators a pay increase. Another political move Perry made back then: He was a top Texas supporter and organizer in 1988 for Al Gore, who ran as a southern conservative rather than the populist reformer he eventually became as the 2000 Democratic presidential nominee. “I came to my senses,” Perry likes to say when asked about his Gore days. Perry can trace his political heritage back to a great-great grandfather, D.H. Hamilton, a former state legislator from Trinity County. Perry’s own father, Ray Perry, served as a county commissioner in Haskell County for almost 30 years. They were Southern Democrats, from the party that produced politicians like Sam Rayburn and Lyndon Baines Johnson. 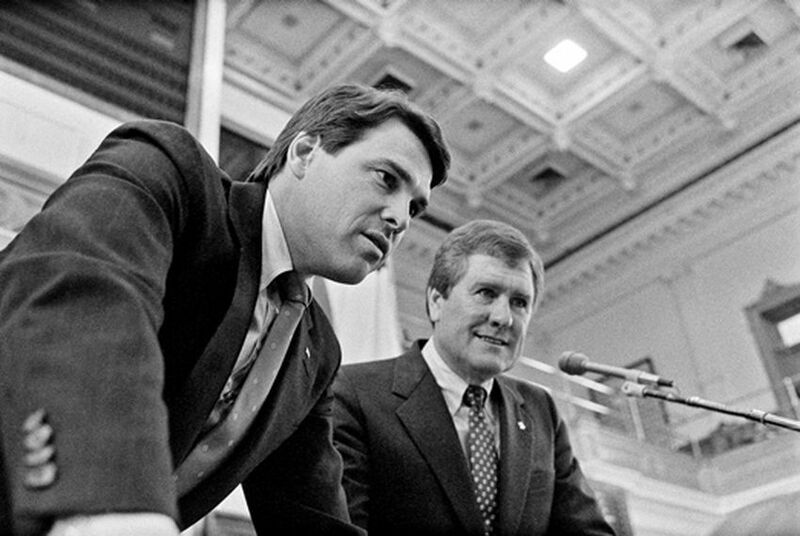 In 1984, Rick Perry, then a young rancher and former Air Force pilot from Paint Creek, about 60 miles north of Abilene, was recruited by fellow Democrats to run for a House seat vacated by Rep. Joe Hanna, according to interviews and news articles. Democrat John Sharp, the former state comptroller who was Perry’s old college buddy, recalls getting a call from Clyde Wells, then the chairman of the Texas A&M System Board of Regents. Wells wondered who might make a good replacement for Hanna. Perry easily won and quickly became known as a rising star in the Texas House. Then-House Speaker Gib Lewis, D-Fort Worth, decided to appoint several freshman lawmakers to the House Appropriations Committee — members he knew he could count on to keep spending low. No matter the label beside his name, the news coverage of Perry’s early years reveals the same ambition and enthusiasm for public office that the governor has brought to the national stage as a potential presidential candidate. At the beginning of his six-year run in the state House, Perry shot down the notion that he might switch parties despite his conservative leanings that put him at odds with his party leaders. After former U.S. Rep. Kent Hance of Lubbock defected to the Republican Party in 1985, Perry told the Abilene paper he was “disappointed,” saying he planned to “change my party” rather than defect to the other side. The gap was obvious by 1989, his last year in the Legislature, when Perry carried a workers' compensation insurance bill that angered the Texas trial lawyers, then a much more powerful force in state politics. That same year The Dallas Morning News named Perry one of the state's ten best legislators, but he was ripped by another publication. The liberal Texas Observer called Perry the “Benedict Arnold of the Democratic Party” for siding too often with Clements, the Republican governor, and not enough with his Democratic colleagues. “If the Texas Observer ever says anything good about me, then I’ve been hit on the head and they can send me back home,” Perry quipped. Rumors that Perry would defect to the GOP — and run against populist Democratic Agriculture Commissioner Jim Hightower — picked up steam by late 1989. On Sept. 29, 1989, he made it official at a Capitol press conference. At his side were GOP chairman Fred Meyer and U.S. Sen. Phil Gramm, a former Democrat who was aggressively courting would-be converts. Perry’s timing, now legendary, could not have been better. He was one of only two Republicans elected to nonjudicial statewide office in 1990. Eight years later, Republicans swept every one of them. Chris Hooks contributed to this report.